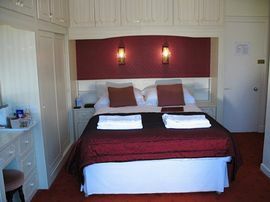 Four Poster bed room with fantastic views. Quiet position 5-10 minutes on foot from Betws-y-Coed centre. A warm welcome to Snowdonia and North Wales awaits you from Stuart and Emma Charlton. 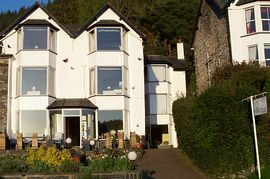 Aberconwy House provides Luxury bed and breakfast accommodation and has been awarded 5 stars by Visit Wales and 5 stars. 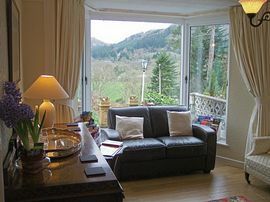 It nestles in a quiet elevated position above Betws-y-Coed, with panoramic views overlooking the picturesque Snowdonia National Park and the village of Betws-y-Coed, a perfect base from which to explore all of North Wales. 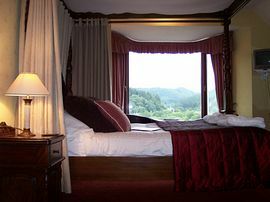 We are totally non-smoking and offer 1 twin room, 4 double rooms, 1 four poster room and 2 family rooms (1 sleeping 3, 1 sleeping up to 4), all decorated tastefully and several enjoying the views across the Llugwy Valley. Check in is from 4pm - 9pm. Bookings are taken for a minimum of 2 nights stay, although Sunday to Thursday we may take 1 nights stay if available, please call for details. 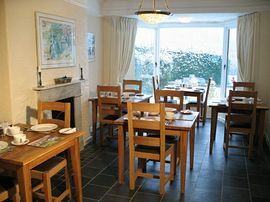 "Dear Emma & Stuart, We have been back home in New Zealand for almost 12 weeks and just wanted to let you know how much we enjoyed our stay in Aberconwy during early to mid June. For a couple who had only recently taken over and with two young children to boot, you are doing a fantastic job!" To find us travelling out of Betws-y-Coed across the Waterloo Bridge, turn left onto the A470. Travel exactly half a mile and then take the turning on your right 'Lon Muriau'. There are a number of B&B boards on the roadside. Go up Lon Muriau, ignore the first right and then take the second right, you will find Aberconwy House on the left. If you are intending to arrive by train we will be happy to meet you at the station.